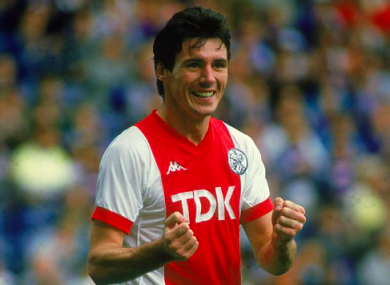 Frank Stapleton swapped Manchester for Amsterdam in 1987, played alongside Frank Rijkaard and kept Dennis Bergkamp out of the team. FRANK STAPLETON WAS part of Sir Alex Ferguson’s very first Manchester United team in November 1986 but didn’t last much longer at the club as the new manager ruthlessly went about putting his own stamp on things. He was still only 30 but the previous two seasons had been a struggle for him, managing just 11 goals in all competitions in 1985 and 1986. Ferguson used Stapleton alongside Peter Davenport up front while he figured out a long-term plan. And, when he signed Brian McClair from Celtic at the end of his first season, it was Stapleton who was first to be cut loose. Later, Ferguson revealed how disappointed he had been with the Dubliner, describing him as ‘a shadow of his former self’. “His reputation was as long as your arm,” he said. “But he had lost his mobility and he just didn’t look like he would ever score a goal”. Still, given the type of player Stapleton was – big, strong and terrific in the air – and the reputation he had, it wasn’t as if there was a lack of English clubs lining up to sign him. But, thanks to an ex-United team-mate, his next move proved a pretty unique one. It was Dutch-influenced Bobby Robson who originally gave Arnold Muhren a taste for English football, partnering him with Frans Thijssen in his Ipswich Town midfield in the late-1970s. Subsequently, in 1981, the unfashionable club – who finished as league runners-up twice – were crowned Uefa Cup champions. Muhren moved to Old Trafford the following year and stayed for three seasons, winning two FA Cups under Ron Atkinson before rejoining Ajax – where he had began his career. In 1987, under Johan Cruyff’s tutelage, the storied club had lost out on the Eredivisie title but claimed the Dutch Cup and the European Cup Winners’ Cup. But, their most prized asset – Marco van Basten – was signed by nouveau-rich AC Milan in the summer and, due to financial constraints, Cruyff was finding it tough to bring in a replacement. Incredibly, he later revealed in his autobiography, My Turn, that he wanted Coventry City’s Cyrille Regis. “For months I had my eye on him,” Cruyff wrote. “A physically strong striker with charisma who was still at the top of his game. Coventry were on a good FA Cup run and we wanted to act quickly in case his fee soared. A month went by and Ajax hadn’t even started seriously negotiating. Coventry won the FA Cup, with Regis as the star, and we couldn’t afford him anymore”. The club didn’t have much luck with other targets either and Cruyff grew increasingly exasperated. It was then that Muhren told him of Stapleton’s situation under Ferguson at Manchester United and that he was available to buy. With time running out until the new season, Cruyff decided to take the risk. He had seen Stapleton play before and knew he was an established figure. But it was far from an ideal scenario, as Cruyff wrote years later. “I remembered Stapleton as a great attacker. He didn’t cost anything because he was still vulnerable to injury. That was how I had to get my players in the end”. Meanwhile, the allure of Cruyff was too good for Stapleton to resist. “I have to admit Cruyff was an influence (in my decision),” he said last year. “When I met him, he was was down-to-earth and normal as a person, even though we know how great he was as a player, and he knew it too! I found him very approachable as a manager. If I had a problem with anything off-the-pitch, he’d listen and it would be sorted out very quickly. If I had any questions, he was always there. Stapleton’s first appearance for the club came in a pre-season tournament game against Torino where he played the first half in a 2-1 victory. He got more minutes under his belt in the next friendly clash with Porto before making his league debut against Roda. But, he was replaced at half-time – an ominous sign of things to come. He did keep his place for the following clash with AZ Alkmaar but it didn’t exactly seem like the best fit. Stapleton – struggling with fitness issues – was immersed in Cruyff’s Total Football ideal and around him were future stars. Frank Rijkaard was the new captain and the side’s key influencer while Danny Blind anchored the defence. Aron Winter, Johnny van’t Schip and Robert Witschige were also regulars while, on the bench – gazing out at a slightly bemused if eager Stapleton – was a blonde-haired attacker called Dennis Bergkamp. “Everybody thinks Cruyff teams were all about skill and ability, but he did the other side too,” Stapleton said years later. Training was intense and the players were expected to be fit. His sessions were as hard as anything I did in my career. We trained all day, double sessions, on Tuesday and Thursdays and he was ahead of his time when it came to the scientific part as well. Injury kept Stapleton out for a while but he returned to start in a 5-3 thriller against DS’79. But there was a problem. Stapleton wasn’t scoring. So, for the next fixture against Twente, he was dropped. Cruyff decided to give some youngsters an opportunity to impress so he handed a winger called Bryan Roy a start and brought on Bergkamp early in the second-half. Both repaid their coach’s faith. Bergkamp scored within 20 minutes of being introduced while, moments later, Roy found the net too. Ajax romped to a 6-1 win and Bergkamp did enough to earn a start in the following clash away to Utrecht. However, the hosts led 2-0 after half an hour. Ajax pulled one back shortly after the restart and Stapleton was summoned from the bench for the final 20 minutes. He replaced Bergkamp but his goal rut continued and Ajax suffered defeat. Short on confidence, just when Stapleton needed a boost, one came along. A European tie against Irish opposition. In the first round of the 1987/1988 Cup Winners’ Cup, Ajax were drawn to face Dundalk, with the opening leg in Amsterdam. But, Cruyff refused to give into sentiment and Stapleton started on the bench. Remarkably though, Turlough O’Connor’s outsiders contained Ajax, ensuring the home crowd grew increasingly frustrated. Scoreless at half-time, the home side were booed off. Stapleton was introduced at the interval but he missed two early chances. Eventually it was Rijkaard who grabbed a fortuitous opener midway through the second-half before the floodgates opened. Blind scored a superb second while Winter added a third with a header. Then, with five minutes left, Stapleton got his moment. Rijkaard took possession in midfield and rampaged forward, leaving a couple of white shirts in his wake. He whipped in a cross to the near post and there was Stapleton to apply a neat finish and stab it past Alan O’Neill for his first and last goal in an Ajax shirt. Stapleton missed the next two league games before Cruyff recalled him for the second-leg with Dundalk at Oriel Park. But, he was hauled off after 64 minutes with the game scoreless. Ajax did score twice to rack up a 6-0 aggregate win but all was not well. Between both games, Rijkaard had walked out, shouting at Cruyff (‘Stop your constant complaining’) as he went. He never returned, ended up at Real Zaragoza later in the season, played at Euro ’88 and then joined van Basten and Ruud Gullit at Milan. By the start of 1988, Cruyff was gone from Ajax too after tensions with the board led to his resignation. Well, he spent the last few months of 1987 on loan at Anderlecht before temporarily returning to England with Derby in early 1988. There was a season-long stint with Le Havre in France, who ‘didn’t hesitate’ when the chance came to sign him, according to their coach at the time Pierre Mankowski. “He was at the end of his career but we signed him based on his reputation”, he told So Foot. “He was a typical English-based striker – excellent in the air and who needed the ball played direct”. Stapleton scored a handful of goals in his one campaign with the club before stints at Blackburn, Huddersfield and Bradford, where he was also, briefly, player-manager. Email “The iconic Irish international and the unmitigated disaster of signing for Johan Cruyff's Ajax ”. Feedback on “The iconic Irish international and the unmitigated disaster of signing for Johan Cruyff's Ajax ”.